Dr. Kathy Ferraro has added frequency specific microcurrent (FSM) at the Center for Holistic Medicine. Resonance/frequency treatments were originally developed in the 1920s by Dr. Albert Abrams. Dr. Abrams was a pioneer in his field and had many followers who reported miraculous recoveries from medical conditions. The use of frequencies(FSM) to treat medical conditions has made a resurgence in the 1990s. FSM has been developed by Dr. Carolyn McMakin MA, DC of Washington. Together with other practitioners, clinical protocols have been developed. FSM is now being used by numerous practitioners in various specialties (MDs, DCs, NDs, PTs) to treat myofascial pain and neuropathic pain in clinical practices. It has also been used in the sports arena because of its benefits in decreasing inflammation and improving recovery time in injured athletes. The treatment involves very low physiologic levels of electromagnetic frequencies applied to the body. These frequencies allow for bonds of scar tissue, fibrosis and trigger points to break. Frequency Specific Microcurrent techniques have been documented to boost immune function, increase ATP/energy levels and accelerate healing of acute injuries. FSM is especially good at treating nerve and muscle pain, inflammation and scar tissue. Impressive results have been seen in the treatment of Fibromyalgia. Dr.Ferraro has been trained by Dr. McMakin in the use of FSM. The FSM treatment is usually 30 to 60 minutes long, and is specific to each individual's condition. Most people will not be able to feel the frequencies, but, a sensation of warmth is often perceived when the correct frequency is reached. For best results, Dr. Ferraro recommends hydration prior to and after the treatments. Some patients have reported significant benefits immediately after or within 24 hours following a single FSM treatment. These reported benefits often continue for 4 days to a week, with the duration of benefit lasting longer with each subsequent FSM treatment. Other patients, particularly those with long standing symptoms or a decreased vital force, have reported benefits only after six treatments. It is important to note that electrons that have been vibrating at disrupted frequencies for an extended period of time tend to habitually return to those frequencies. This often occurs within four to seven days following an FSM session. When this occurs, repeated FSM treatments at appropriate intervals may be necessary. Though early intervention generally enhances favorable outcomes with FSM and other medical interventions, good outcomes have also been observed when using FSM for longstanding symptoms, even when other treatments have failed. No technology, device or technique is 100 percent effective and FSM is no exception. Some patients may not respond. Predicting in advance who will or won't respond to FSM is not possible. No significant or lasting adverse reactions to FSM have been reported. There are many other conditions that have shown positive effects to treatment with FSM. Feel free to contact us to see if FSM is right for you (717) 243-0616 . FSM is complementary to acupuncture, physical and occupational therapy programs. Acupuncture can be employed during an FSM treatment. When normal tissue frequencies are restored, improved tissue function can result in backed-up cellular toxins being released and possibly the occurrence of flu-like detoxification symptoms. These symptoms have started as soon as an hour after a session and usually last two to four hours and up to a day or two. Drinking 1 to 2 quarts of water in the first two hours following a treatment is recommended to help prevent or lessen detox symptoms. Children should drink one extra glass of water or juice prior to FSM treatments. Children tend to be less dehydrated. As they are smaller, large water ingestion can cause dangerous shifts in their electrolyte balance. Please avoid using lotions , creams or oils prior to your appointment. We ask all patients to avoid wearing any perfumes, aftershave or scented personal care items while visiting the Center for Holistic Medicine. We are a Fee For Service Company. Payment is required at the time of your visit. You will be provided with a superbill with diagnostic and treatment codes. This can be submitted to your individual insurance carrier for reimbursement purposes. 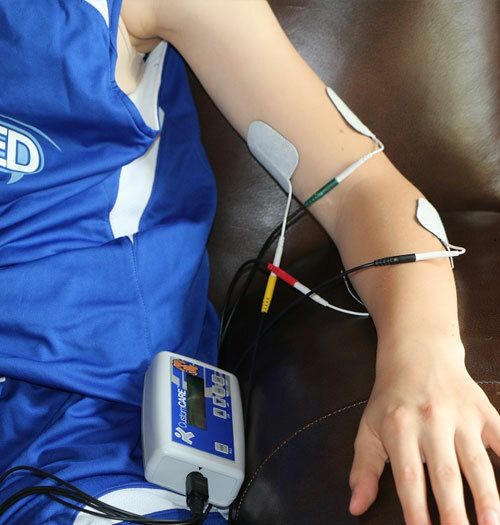 Please note that FSM treatments are considered a therapy and are usually billed under tens device therapy codes. It is prudent to ask your insurance carrier if they cover these therapy services. Follow up sessions are usually 50 minute to 1 hour in duration, although 1 program may be run, often times, multiple programs are run simultaneously to get the most out of your treatment session. Using multiple devices allows us to treat more conditions in a shorter period of time and frequently results in improved recovery time. Pricing may vary based on number of devices used.